It’s challenging to realize once again how much time has slipped by since I’ve contributed to my blog. My apologies for anyone who has still been wondering how life is in Michigan. This journey to the northern lower peninsula of Michigan that no one could believe I would want to do. My first winter after twelve years in southern California has been steeped in beautiful, gentle and reflective moments. I had forgotten how walking outside when temperatures are in the teens, or twenties for that matter, truly wakes you up. My attention and awarenesses are immediately enlivened and present. The fresh air, especially near the lakes, is filled with chi and my cells welcome an effervescent experience. I have to admit that as the ice formations on the shores of Lake Michigan begin to melt once again, I notice I’ll miss this diversity. The changes, this time of year especially, on a daily basis are truly breath giving. I wake up excited to walk down to the shore to see what has happened over night. I feel very blessed to have this time right on Lake Michigan. I’m certain though that when the water is warm and I can go in again…I’ll have new cause for enthusiasm. Especially when my kayak goes with me. Tomorrow will officially bring the first day of Spring and I figured it was high time I share some winter wonder. I have posted some of these photos on FB too. Some of the most radical changes over these photos actually happened overnight. When the temperatures drop below freezing and the wind gusts, the amount of ice that forms is unreal. One day you can walk to the shore and right into the water, and then…wake up the next morning and the shoreline is twelve feet further away. The circular patterns within the ice, like perfect circles are astounding. Apparently, there is an American Stonehenge underneath Lake Michigan…..must be some pretty amazing vibes making magic happen. Lake Michigan has a reputation similar to the Bermuda Triangle…they call it the Michigan Triangle! When you have time on your hands there are some cool videos about it. Anyway, the juxtaposition of sand and snow still looks a bit foreign to me, maybe by next winter I’ll get accustomed to this arrangement. I find myself wishing I had more science background to have some knowledge as to how in the world these beautiful things are created. Why some ice is crystal clear, others totally opaque, and some are intricate lacy forms like flora and fauna occur, beside other perfect columns. My wonderment and reverence for Nature is continually expanded. I hope you enjoy the photos. I’d love to hear your comments. And, I hope wherever you are that you’ve enjoyed winter and look forward to welcoming new beginnings in your life. Joyous blessings to you…Happy Equinox! 59 years ago my parents built a home and today is the last day our family will be the stewards of this land and create memories within these walls. I’ve primarily dedicated the last few days to gently convincing the peonies, that my mother planted 59 years ago, to let go and join us in our next chapter. These peonies were 50 years old when my mother brought them to this soil. Peonies do not like being moved…kind of a lot like my mother. Oh, and my mother cherishes these peonies! So, for the past few days these 109 year old tubers and I have intimately been engaged with disengaging. Gently striving to uproot…..both them and my mother. Who decided to sell her home quite a few months ago but now, when it’s really happening, a whole new level of reality is awakened. And my mother, who is 85 has never sold a home before, and never lived anywhere except the Pittsburgh area. As I’ve hunched, and hovered, over these dormant stalks and their roots which are quite connected with rocks and clay…I’ve had lots of time to root through my memories. The good, the not so good all interwoven in my mind and in this landscape. Over the hours I’ve cherished being out of the chaos of the inside of the house. Out in my childhood yard I find peace, just as I did so often in my childhood. I continue to be in awe with how often our outer world is so congruent and reflective of our inner world. I miss having gardens and a home to work in and experience those opportunities of parallel realities. Soon this will all manifest. For I too am embarking on a whole new chapter. This time here in Pittsburgh is the next to the last leg of an over 5,000 mile journey that began just one month ago. I had so hoped to blog along the way, instead of backtracking. Fortunately, I did journal on the spectacular places we experienced on our cross country journey and I am look forward to reliving them through sharing. Though now in the present, I have one more day of driving and this time my van is filled with peonies, tree peonies, thyme, lily of the valley and bee balm. And given that they are pretty much all in peat moss…it should be a “fragrant” journey up through Michigan. Until then… please stay tuned for some beautiful photographs of our magnificent country. With light, joy and peace. The last time I blogged I shared about my grasshopper messenger. And, here I am finally taking the leap of faith that I know I've been being nudged to do for quite some time. Two days ago I drove out of north county San Diego toward a new chapter of my life. I arrived in Southern California almost exactly 12 years ago, with no plans to live here. By design of fate I pulled off the freeway, because of traffic, on a journey back to New York with plans to camp there for one night in Encinitas.....Well, the Hotel California effect went into effect. Now, it's time, it appears to experience a new region of the country. I have no idea what it will be like to live in a part of the country that has seasons again, but I'm excited! I'm fueled with gratitude and oh so many wonderous memories of life here in southern California. An unexpected chapter that was filled with beautiful people, beach walks, gratifying work and flowers. Encinitas I came to learn, many months after I moved there, is the flower capitol of our country. My photo library is bursting with thousands of images that I will carry with me. Thank goodness for digital files. Currently, I am in LA waiting for my older son Auston to finish up work and then he and I will take off together to begin my journey toward Michigan....the city of Traverse City in the lower peninsula. Auston will be traveling with me most of the way as we camp across the US. We've never been to Montana, and I've never taken the northern route across our country. We plan to begin tomorrow. I'll do the best I can with balancing being in Nature and staying somewhat connected.... at least on occasion. Please check back and leave me messages thru my blog. May the new journey....the pilgrimage toward home.....begin. And then in she hops....but can I? It seems, not surprisingly, that it is interactions with other living beings that ignite creative expression and bring me to this long idle blog. Writing to no one in particular, though feeling an overflowing of gratitude that simply must spill over somewhere. From my weeks with ladybugs in Michigan, today, it was a grasshopper. Quite amazing really, I’m happy I didn’t crash my car. I was driving on the 101 in southern California and happened to catch a glimpse of two very long legs starting to move out from under the flip side of my sun visor. Moving so…yes alive…and they were very long and very close to my face. Fortunately, I was able to quickly pull over as one of the largest grasshoppers I’ve ever seen worked it’s way around my visor to greet me. We paused taking each other in. I wasn’t worried about me, I just wanted to capture it so that I could return her to Nature. My assumption was that she must’ve gotten into my car the day before when I was transporting huge clumps of yarrow from my community garden space. I had a few plastic berry baskets ready to return to the famers market so I easily captured her. The baskets were fine enough mesh, or so I thought, that she would stay contained. I wanted to return her to the garden and not leave her in a new town in someone's yard. So off we went. The minor detail was that I needed to stop and protest for an hour at the Wells Fargo Bank. I returned to my car and found that she’d escaped from the baskets that were on the passenger floor. Once again she was loose in my car. I pulled into the community garden parking lot with a plan to leave all of my windows down and hope for the best. She promptly stepped from around my visor, once again inches from my face watching me! I was so happy. I like my car but it is not a proper home for a grasshopper. Moments later she was happily taking flight to the garden. Her second appearance truly captured my attention. I sat in the garden parking lot and looked up totem medicine of grasshoppers. Even though I already knew this message. I wanted to see it in black and white and read it again. Grasshopper had visited me almost two years earlier before I moved from my last home…. helping then to nudge me out the door. Seems I need that once again. I’m deeply grateful she came back today. We have many teachers all around us. Nature and her spectrum of living beings and phenomena have taught me, and healed me, more than all of my human “teachers” combined. As we awaken - we learn. There are signs and messages every day of our lives…. are you listening closely and truly watching? The name ladybug has its roots in the middle ages, when it was dedicated to the Virgin Mary and called the beetle of our lady. This links it to spiritual idealism and religious devotion. Ladybug people frequently have past lives linked to religion or church – daily meditation is recommended. Ladybug showing up in ones life foretells a time of luck and protection, where wishes start to become actualized. The seasons of autumn and spring will be the most plentiful times for those with this power animal. Worries will quickly disperse when ladybug appears as they shield us from our aggravations, paving the way for new found happiness – aim high, you will get what you focus on. Ladybug also cautions us not to force things or try to hard to fulfill wishes, go with the flow and let things take their natural course. Your wishes will come true – in their own time! It started raining during the night. It’s grey and peaceful outside. I’m not sure how long I’ve been here in northern Michigan as the days tend to blend. I’m aware that I’ve moved through a spectrum of emotions. The changing outer weather patterns reflecting my inner weather. 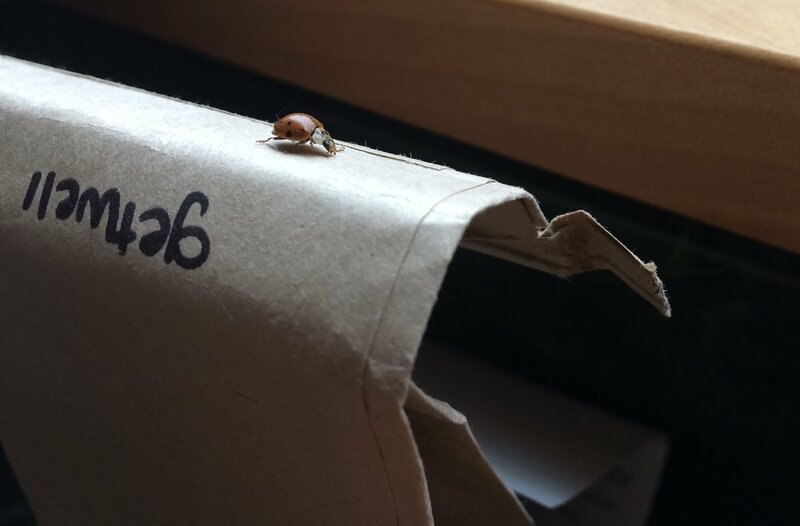 I continue to share my space with ladybugs, quite a few of them as it turns out. With their short lifespan I am ever more aware of their fragility as they continue to awaken greater mindfulness within me every day. This pilgrimage I’m on to find a home has not yet resulted in locating a dwelling. It has though afforded the opportunity to honor and strengthen “my home”. The temple that is my body and home to my spirit. The two days that I did not see a ladybug I missed them…. watching ever closer... my every step. They’ve become more bold in sharing my yoga mat and the kitchen spaces. I take this as an acknowledgement that I’m doing an okay job at cohabiting. My awareness of the possible outcomes of even my tiniest actions has grown exponentially. I’ve also learned that ladybugs can intensely feel vibrations through their legs, allowing them to sense the energy of what they touch, gifting them with another form of protection. This may explain the unique paths they choose that have fascinated me. I am deeply grateful for sharing this time with such a powerful and precious presence. I hope that if you have the opportunity to spend time with a ladybug, or two, that you seize those moments and embrace their blessings. I have two new companions, though I technically live alone. I talk to them, attempt to feed them and mostly watch them, or watch out for them…they are independent travelers. Let me back up. I’m staying in northern Michigan. It’s January, the temperature outside today is 12. We’ve moved up to the double digits. That’s good. I came here from southern California where I’ve lived for the last eleven years. It would be stating the obvious to mention that I’m not quite used to these temperatures and have been inside this week more than I am familiar with. Right after I settled in here I met my first housemate, a ladybug, at one end of the house…the bathroom window ledge. I met ladybug number two at the other end, in the kitchen. I thought they might not be aware of each others existence so I moved one down to the bathroom to say “hi” to the other. There did not appear to be an exchange of salutations, or interest. Not certain what that was about, though it felt like I had done what my left brain dutifully wanted to do. Make certain, which they probably already knew, that there was other life inside this heated box. Knowing that ladybugs eat aphids, and there are no houseplants or aphids here, I set out to see what else I could find for them. More left brain activities. I’d read that some ladybugs do become herbivores…like me. I picked up a few of the dead flies that scatter the cabin and placed them near my new housemates. For good measure and cuisine options, I added some leafy greens. They didn’t appear to be interested in any option. Strike two and three. Quite frankly, I’m uncertain what they are existing on. I’ve been here over a week. The flies that had been hanging on to life when I arrived have since passed or are in a really deep meditation. Yesterday, the ladybugs went MIA for over a day. I thought they might’ve joined the troops speckling the cabin. Mostly, I was worried I might’ve stepped on one of these mighty little beings. I realized I missed watching out for them. It’s amazing really. They are so small and vulnerable and they choose to hang out where I walk or where I’m doing yoga and I’m always concerned I’ll step on them or smash them. It keeps me alert to my surroundings in a very mindful way. I appreciate that. Sometimes one of them will pause and sit in the middle of the kitchen floor. Really? Needless to say, I’ve created a relocation service. They don’t have much input. I’ve tried explaining my challenges with their choices…. forgetting the order here. They are here to teach me. I looked at a few sites to explore the Native American ideas about the totem, or medicine teachings of ladybugs. Native Americans saw every living being as a teacher. I found varying interpretations. One site said that a single ladybug can eat 5,000 aphids during it’s 6 week cycle of life. Wow…that’s almost a 1,000 a week and my companions seem to be existing on air. I wonder how that’s going. They still have the energy to move around and join me in new places in the house. Kind of like what dogs and cats do. And just as the four leggeds I’ve known have enjoyed being in the energy of a yoga practice…. one of these ladybugs also seems to enjoy sharing time on the mat. She shows up at the darnedest times and I’m so grateful I haven’t hurt her. Between the two of them, cooking and preparing food is pretty much an exercise in ever deepening mindfulness. They sit near the sink sponge, or on the vegetables I’m about to pick up and chop. Thank goodness they haven’t been hanging out on the cutting board. One day I watched one of my teachers, as I’ll call her, walk along the edge of the windowsill. Not on it or below it. She walked the edge, exerting what I imagined to be so much energy to hug that edge. I pondered as I watched her, why? Why not move over a fraction of an inch to either side and have a leisurely stroll on a solid surface and enjoy the view? Obviously, I’ll never know the answer. I do see animals as teachers and as I sat, slowing down to witness, and marvel in her journey I was reunited with my awe of all of life. Mind you this little being can also fly…. and she chose not to. I’ve often wished I had the wing option. So why not embody that option? Was this walk along an edge her exercise class for the morning? Or, her adrenaline rush like when we rock climb? A tumble for a ladybug that results in a flip can be fatal. There are a number of other ladybugs whose lives ended in here before I arrived. This ladybug chose a path on the edge for a reason, and I witnessed it as being hard. She may have loved it though and it might have brought her great joy to accomplish it. None the less, I found myself questioning what am I making harder in my life? Are there steps I could take with greater ease and not expend so much energy, or resources? The other day when my tiny mindfulness teachers were MIA I realized even more how much I appreciate sharing life with these cabin dwellers. In here, protected from the frozen landscape, I am slowing down even more thanks to them. Choosing to make introspection and mindfulness more of a priority is bringing deeper joy, peace and satisfaction to every day. Insects have so much to teach us and will always be some of my favorite beings. About to happen...haven't sprouted those words and wings yet. Please check back soon. I look forward to finishing building this site so that I can begin to share images and information to inspire.....namaste.